Research shows that writing down your goals (writing a blog post every day in November) and then telling people who can help you achieve them (all the readers who comment so I know I'm not just throwing stuff out there into the ether) makes you more likely to reach them. At work, we have put this into action for the past year or so. At the beginning of every week, everyone I work with records 2-5 goals and the specific things we will complete to reach our goals. We make this record in a public forum—everyone can see what I'm planning to accomplish and I can see what everyone else is working on. At the end of the week we give ourselves a 1-3 score: no progress, progress but not finished, achieved. It does actually help me as long as I don't get too ambitious; I'm terrible about being realistic about what I'll be able to accomplish any week I'm traveling. If you have never really thought about goals, this Beginner's Guide to Goal Setting is a good place to start. In my creative work, I have done this for many years by participating in the Productive Spinners group. For the past year or so, I've dutifully updated but made almost no progress. I enjoy seeing the diversity of projects the group members undertake, but I need to do a better job working on all of my projects. 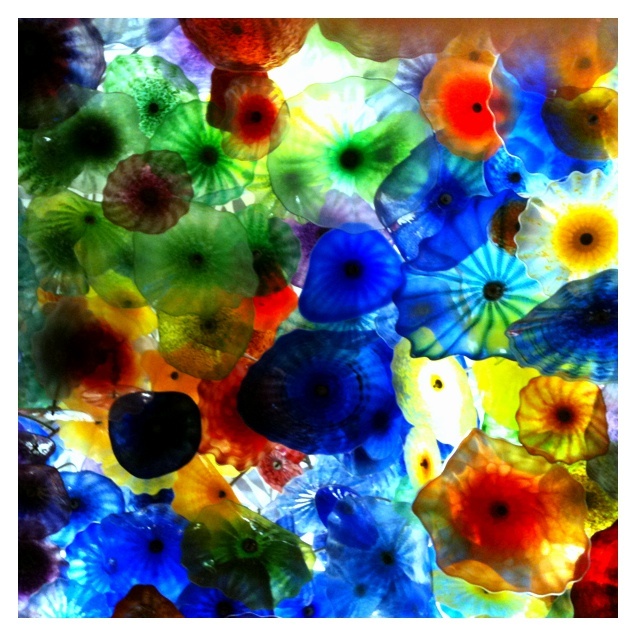 Be less busy while to making forward progress on my creative projects. Here is how I plan to get there. 1. Set weekly goals for work and home. Share the work goals at work and the home goals on this here blog. When I'm at work, start every day by focusing on one of my goals for the first hour or two of the day and the first hour or two after lunch. Get the big important stuff done before I start reacting to the incoming emergencies. 2. Reduce my screentime. Limit television to 1 show per weeknight and only the football games I care about on the weekends. 3. 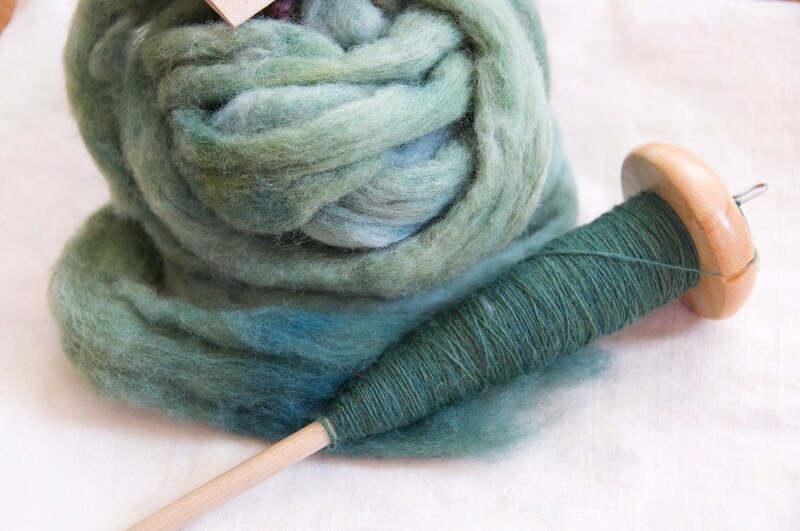 Spin or knit during that limited TV time rather than multitasking and reading Ravelry or Facebook at the same time. 2. 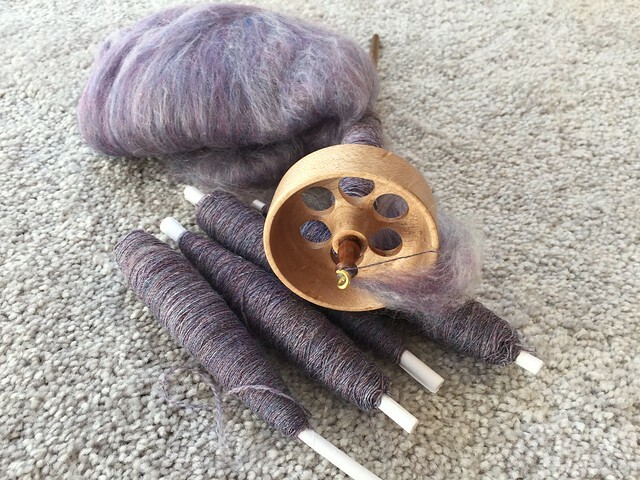 Spin for at least 20 minutes every day—on the merino-silk when I'm home and the Abby Batt while I'm in Seattle late in the week. This week, I'll remember to pack the spindle and one of the socks in progress to keep me entertained while I'm on the road. 3. Take care of myself by practicing yoga or doing back PT exercises daily—ideally first thing in the morning. If I get out of bed and do this the minute I wake up instead of dozing for an hour after the alarm goes off, it will be done before I'm usually in the shower. 4. Unpack 1 studio box or bin every evening I'm home. And this means unpack completely—find a home for the entire contents or get rid of it. 5. Move everything out of the guest room back in to the studio by the end of next weekend. Mom and Dad need a nice place to sleep when they visit for Thanksgiving. If you want to join me in this exercise to be less busy and achieve more, leave a comment and share your plans on your own blog, or in the comment. We'll make a little community of friends commited to working on the things that matter and supporting each other as we do that. We're halfway through November. 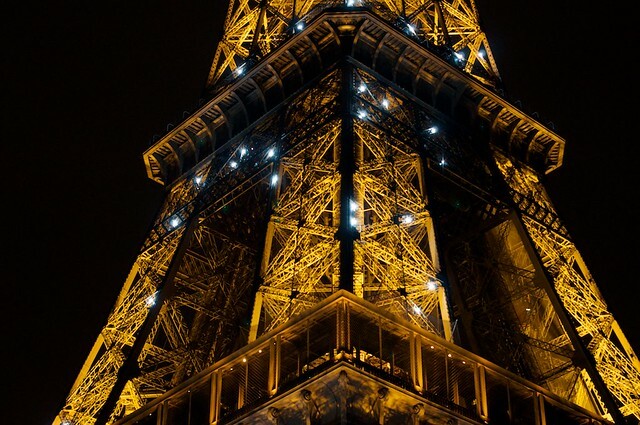 I've written fifteen of the thirty blog posts in NaBloPoMo. I'm halfway through setting my end of year goals. I don't have a whole lot to show for it yet—just some thoughts on paper. So no promised list tonight. 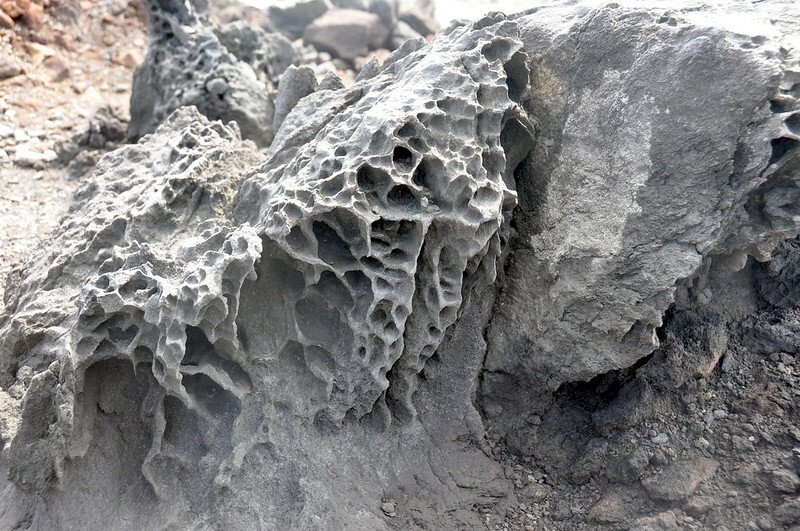 Like the lava, making achievable goals is hard. I was not busy today. I bought groceries and made onion-free veggie broth and pumpkin soup; sadly, the soup is just OK. I spun a little. I watched some football. And D and I rented a truck so we could move the last few things out of the garage at our old house and buy bookcases at Ikea. Now I'm tired from lifting and hauling and completely overstimulated from the trip to Ikea. Every person in the elevator to the garage looked completely beaten down by their shopping experience. It's time for some restorative yoga and then sleep. 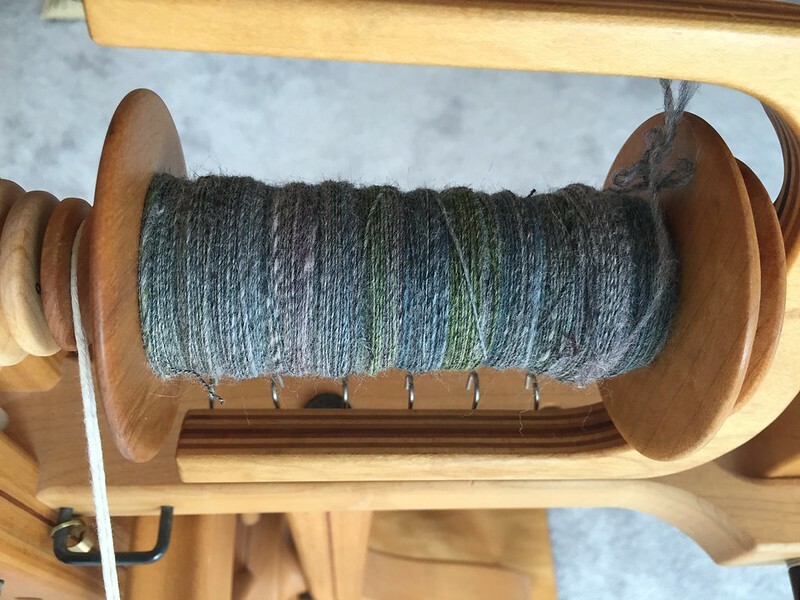 Here's proof that I do still spin on a spindle. For the past week or so, I've spun at least a little nearly every day. I may only manage one or two makes on a spindle while I wait for the water to heat for my morning cup of decaf. Slowly, I'm spinning this pair of lovely batts from Abby (purchased in 2011) into singles on my zippy Spanish Peackock spindle. Eventually, I'll ply all the singles and knit something small and lovely. For now, spinning this yarn spinning calms and centers me. I'm off on a trip for the rest of this week. I have posts planned for all the days I'm away. I've made space in my suitcase for this little project. And for the second flamingo sock. And for my yoga mat. 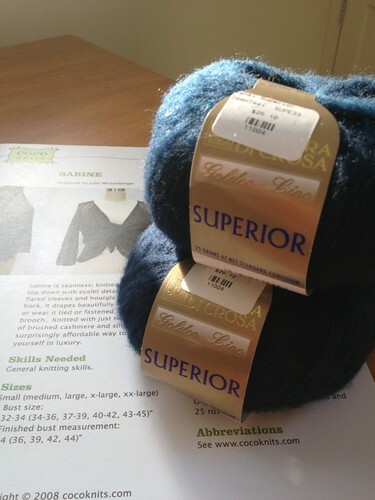 Even though I have too much wool, I cannot resist Tina Newton's monthly surprises. I have tried to give up the Rockin' Sock Club and the Rockin' Whorl Club, but I keep returning. 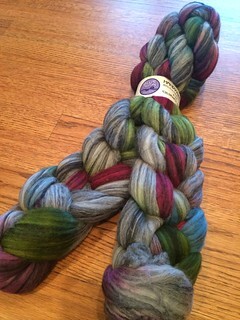 The distinct color patches in August's fiber offering inspired me think creatively about how to spin a multicolored top. 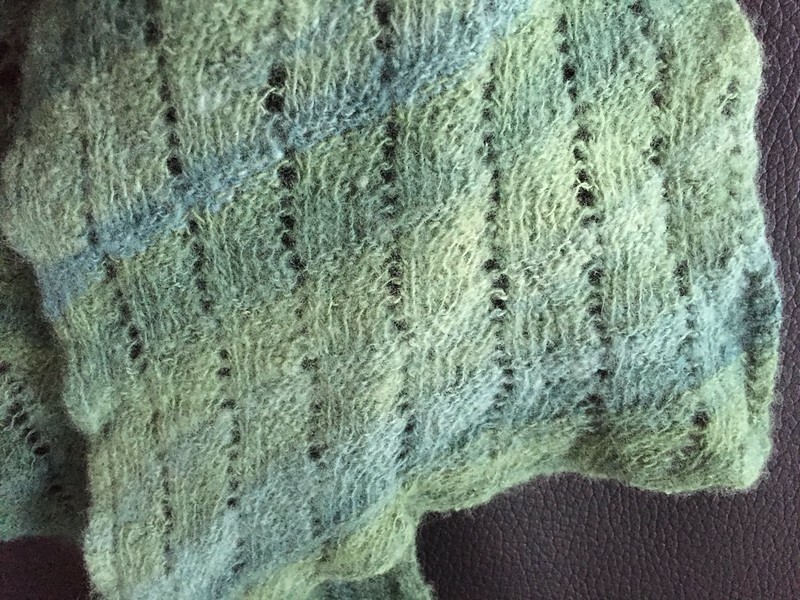 A mystery knit along requiring two or three colors of yarn pointed the way. 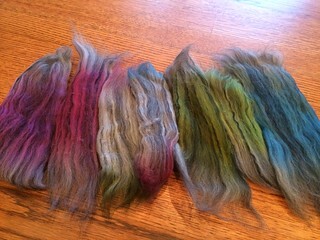 I spent a beautiful evening splitting the braid into the individual colors and then sampled a few tufts on my Matchless. 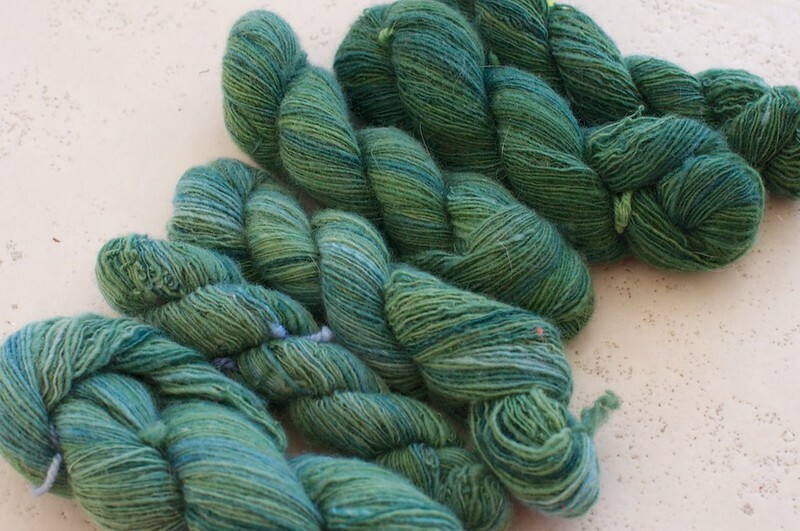 I fondled and pondered three little skeins. I knit those lovely skeins into a big swatch before I could take pictures of them. Then we found the house, and everything except for getting all the purchase and move ducks in a row got put on hold. 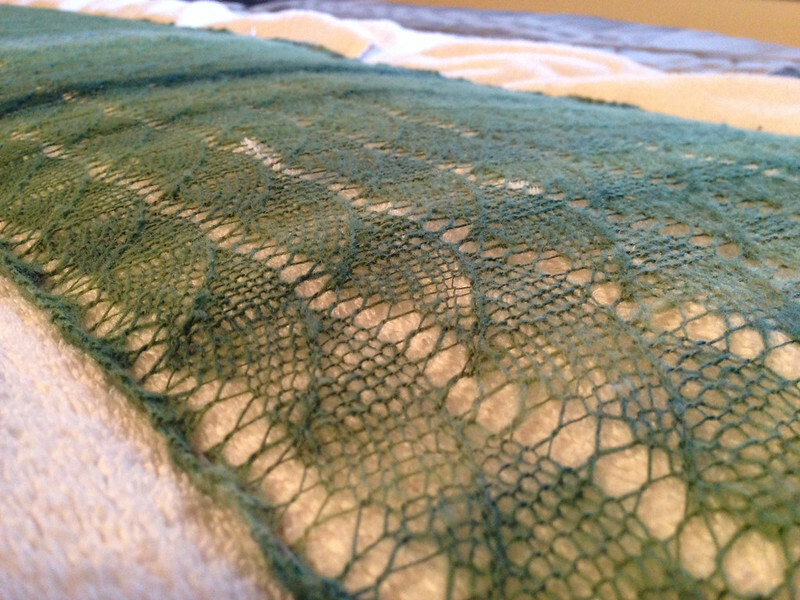 The clues for the shawl are all out, but I've avoided looking at any but the first one, and I haven't stalked any other projects either. I want to maintain the big surprise, even if it takes me an extra month or three. Now that we've moved, I'm back to it. I decided to spin this BFL-tussah silk blend more worsted than woolen (from the end with a short forward draw rather than from the fold with a long draw). I'm still deciding how to blend the green/blue and red/pink spots into two different colored yarns. For the sample, I tried two blending methods: I drafted the two colors together and I spun one ply of each color for barber-poled yarn. Top is blended, bottom is barber pole. 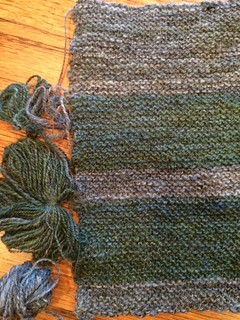 Which do you like better for a garter stitch crescent shaped scarf/shawl.